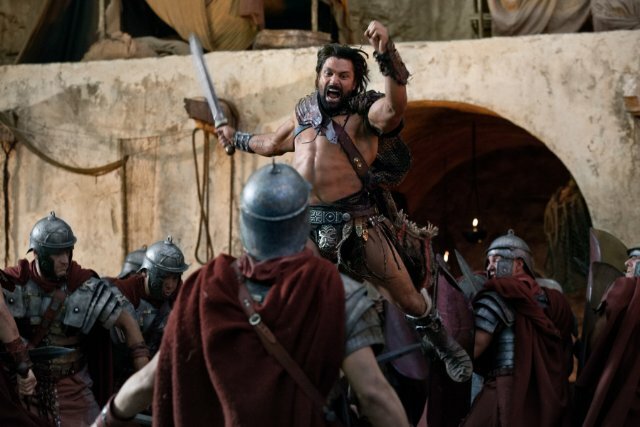 Spartacus S03E05 – Blood Brothers: much like last season’s 5th episode – was brilliance. Spartacus and the Roman Military Leader Crassus have been engaged in a mental chess game match all season. In this one Spartacus made all the right moves and yet was still out manuveured by Crassus. On the action front this show continues to set the high bar on action sequences with swordtacular battle scenes. Again and again. And like last season’s show shifting 5th episode which saw the gladiators leave the arena and their slavery behind forever, Spartacus has lost the city. Just as he was poised to draw out and divide Crassus’s forces. To the hills they must flee! Crassus has gained the upper hand in battle while at the same time the rift between he and his son, Tiberius, has now become permanently irrepairable. The foreshadowing irony of Caesar stabbing Spartacus in the back was most delicious indeed. I’ve taken stabs at fiction writing here and there but never have I experienced that AHA! moment when unrelated items have coalesced into a new and unique idea that other writers talk about. Part of my problem is that I have read so many takes on how to write the process has become overwhelming plus my own unintentionally created roadblock of wanting to write something big and epic so that it will move people. A bittersweet story much like Frodo sailing off to the Grey Havens after saving Middle Earth. That’s a tall order for any writer. Especially one starting out. So I’ve refocused my direction and am now directing my energies to smaller pieces. I mentioned in a previous post that I had sent off a piece for a 200 word micro-fiction contest. That’s about as small as one can get! Genre fiction is where I wish to write in be it SF, Fantasy, or Horror. I have seen it said countless times that genre fiction is about the characters. Take a character and put them in unusual circumstances. Such circumstances arise when you take two previously unrelated ideas and put them together in a brand new way to push your characters. Well I have achieved that AHA! epiphany. The catalyst for my moment of insight was a lovely piece of writing over at Flash Fiction Online – “Beholder” by Sarah Grey. This is a small story about technology versus man that elicits, for me, a big emotional response. That’s the kind of story I want to write and Beholder gave me the spark to put two disparate ideas together. So I am working a piece that takes something I do often – walk our dog and a concept from a TV show. I have it all mapped out in my head. I know the whole story and how it will end. How well putting those two ideas together works is throttled only by my skill as a writer to tell it. Exciting! And scary.